What is the best speaker wire from receiver to speakers? With the blade/blade interconnect cable is there one blade that carried the info like with the pin/blade cable or do they both carry the info? MIT Cables, accept no substitute. Both blades carry a signal. Many thanks F1nut. I have been reading many of your posts and you clearly know these speakers. Will Polk Audio still make the blade/blade cable? Order through Customer Service? Yes, Polk still sells the blade/blade cable. It runs $40 something. Call to order. Hi. My first post here. Reviving an old thread. I just got a pair of SDA 2A. I took off the terminal plates and was surprised to see that only one pin of the interconnect has a wire connected. That can't be right can it? The interconnect cable has two wires in it. Is there a reason someone would disable the interconnect? Any info is greatly appreciated. Do you have a blade/blade or pin/blade SDA cable? Both blades are active in SDA2a so yes. Thanks! I'll open them up later and see what's going on in there.. It may be possible that you've got an early pair of 2B studios--These featured a blade/blade interconnect but only the small blade is connected. Check your mid woofers--2A should have a pair of MW6510's; 2B should have MW6503 stereo driver and MW6511 dimensional driver. Ok, one mystery solved. They are 2B Studio. I'm having a hard time understanding how the dimensional effect works with only one wire going between the speakers. The Dimensional speakers are hooked up across the positive terminals of the amp. So they receive the "difference" signal, which is the opposite of the summed or mono signal. 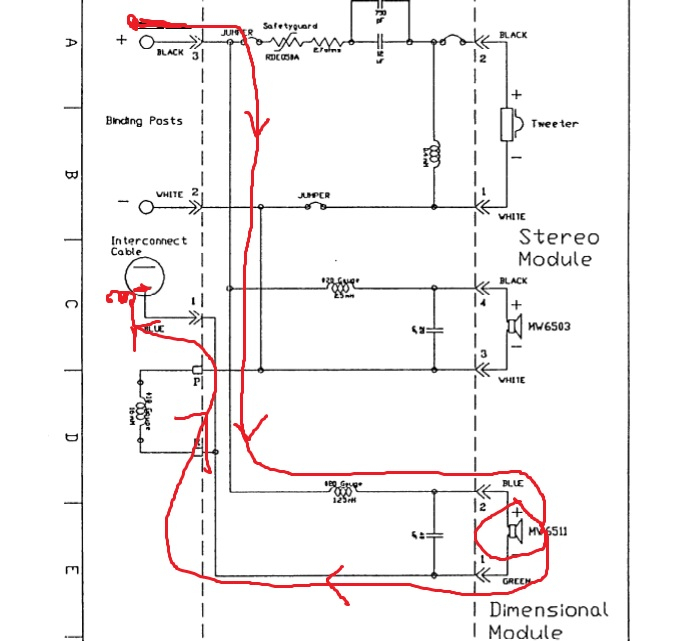 Picture one big daisy chain from the left positive of amp through the left dimensional speaker, then through the interconnect then the right dimensional speaker then back to the positive right side amp. There is a bit more to it, but that is how the Dimensional or surround or difference channel is wired. The dimensional speakers receive bass from the left and right respective channels also, but the dimensional channel only works on the sound above the bass. That makes sense. Is this also the reason the amplifier must be a common ground amp?